Do you find yourself looking tired and older than you feel? Have your laugh lines around your mouth become a permanent fixture or your fine lines on your forehead become creases or deep folds? As the years go by, the skin begins loosen on the face and neck. You buy the potions and lotions you exercise, eat right and get lots of sleep (you do, don't you?) but your crow's feet and bags under your eyes still appear.. The jaw line softens into jowls, and beneath the chin, another chin appears. Perhaps you have lost a lot of weight and kept the skin (it happens!) Everyone has their own reasons for wanting a facelift and the great thing is you have a lot of options and techniques available to you to get the results you want. Not every facelift is the same. Some people want to look 15 years younger while others only want to look “fresher and less tired” Please read through this information to find out more about facelifts and what they can and cannot do. The most common misconception about facelifts / rhytidectomy is that they deal with the entire face. They do not! A facelift only addresses the bottom 2/3's of your face including your neck. 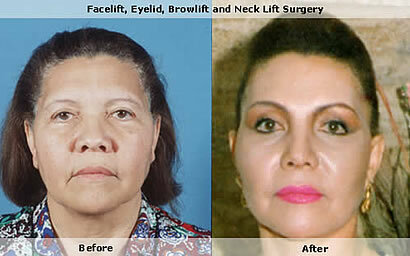 A facelift does not remove bags or excess skin around your eyes. That procedure is called Blepharoplasty (for your comfort and ours we call it eyelid surgery) A facelift also does not address your forehead. So if you have brows that hang down around your eyes or if you have deep wrinkles or creases on your forehead you would be a good candidate for a brow lift. Many people only need a facelift while other need what we call “the works” which is facelift, brow lift and blepharoplasty. There are so many options out there the combination of procedures and treatments are endless and should always be customized for your particular needs and wants. Here is some information about facelifts. Please read through it and if you have any questions you can always click on the chat button at the top of the page and a real person can help you! Remember the best plastic surgery is sun block!! An ideal candidate for any type of cosmetic surgery will understand that cosmetic surgery is intended as a means of enhancement. A facelift can have very dramatic results depending on the patient, but individuals should be realistic about the results they can achieve through surgery. If you do not meet all of these criteria, but meet some of them, you may still be a good candidate for a facelift. If you smoke you must quit at least 2 months before the surgery. Smokers have a 1500% higher risk of complications. If you have good skin tone, it is more likely that your skin will respond well to the surgery. Many people start a extensive skin treatment program months before their surgery to increase elasticity and improve skin texture. See our wrinkle treatment page for more information. You are also at increased risk for complications if you have diabetes, poor circulation, heart, lung or liver disease, smoke, have a family history of blood clots, take certain medications, etc. You'll want to discuss your medical history thoroughly with your physician before you choose to undergo surgery. So now what let's discuss what a facelift can and cannot do! A facelift targets the lower 2/3rds of the face. remove jowls and sagging skin. Change the texture of the skin or get rid of age spots, acne scars and fine lines. Reduce bags, wrinkles, and excess skin underneath or above the eyes. Address issues in the upper 1/3 rd of your face including your eyes and forehead. To get an idea of the results you might have, place your fingers on the center of your cheeks and press the skin up and back. Skin folds can be tightened and reduced, but not eliminated. If you softly pinch the skin in front of your ear, you'll see how much skin can be excised during the procedure. At the initial online consultation you will be asked to send a digital photo including a side and frontal view. Your doctor will ask you to describe in detail what you would like improved. Be specific about what you would like done. Bring up all of your concerns no matter how small. This is your time to discuss your wants and desires so your surgeon fully understands your expectations. Now that your surgeon knows what you expect he'll be able to determine whether your goals are realistic. Your physician will then examine your skin, hairline, and structure of your face to determine which techniques will be employed, where incisions will be made and what results can be achieved. Your skin type, thickness and texture, your age, and pre-existing sun damage will all effect the final result. Do not take aspirin or anti-inflammatory medications, Vitamin A or any blood thinning medications for 2 weeks prior to surgery. Set up a hotel recovery area: lots of pillows, books, magazines, journal, stationery, lotion, baby wipes, tv, videos, remote control, etc. Follow your physician's directions carefully regarding medications, eating & drinking, etc. SSI provides an overnight stay in the hospital for all facelifts to ensure your comfort and monitor your recovery. SSI and the Plastic Surgeons we work with do not categorize a facelift, under any circumstance, as an out patient procedure. Anesthesia: General or Sedation Location: SSI performs every surgery in a Hospital Surgery time: 2-4 hours. Depending on your face and problem areas, your surgeon may choose a two-layer face-lift, a skin-only face lift, a deep (subperiosteal) face lift, neck lift, laser or endoscopic lift. In a two-layer face-lift (the most common procedure and generally the most effective), incisions are usually made in the contour of the ears, beginning in front of and extending around the earlobe and back into the hairline. After the incisions are made, the skin is separated from the facial muscles and skin fat (the doctor may remove excess fat) and the skin is pulled up and back to tighten the muscles of the face and neck. The surgeon may tighten the underlying tissue, the sub muscular aponeurotic system (SMAS), that tightens the neck and lifts the cheeks. The skin is then pulled back and any excess trimmed off. The incisions are then closed with stitches and metal staples may be placed in the scalp. If you have elected to smooth your chin and neck, there may also be a small incision hidden underneath your chin. A small drain tube may be placed under the skin to collect excess blood and prevent swelling. The incision is then sutured closed. The head is then bandaged to prevents fluid collection. Pain Level: Moderate discomfort. 1-3 days of pain medication. When surgery is completed, you will be taken into a recovery area where you will be closely monitored. A bandage will have been wrapped around your face to minimize swelling. The bandage may make it difficult to hear. Your private assistant will be with you at the hospital and be there to help you in anything you may need. Your surgeon will follow up the next morning to check on you and change your dressing before you are released. Your face and eyelids will be swollen and bruised after surgery. This will be most pronounced the first few days and lasts anywhere from one to six weeks after surgery. Most bruising will disappear within two weeks. It may take months to fully heal. The speed of recovery depends upon the type of skin, age and healing ability of the patient. Most patients can resume everyday activities about two weeks after surgery. Your face may feel numb for a few weeks or even months. This is normal and usually subsides. Scars take longer to fade, but because they are hidden in hairlines, behind the ears and in natural folds, they shouldn't be very noticeable. 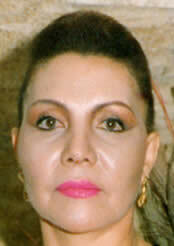 Expect that your facelift will turn back the clock approximately 7-10 years. You will continue to age on your new face. The results of your facelift may be dramatic or subtle, depending on how you looked before surgery. Since the healing process is gradual, you should expect to wait at least several weeks to fully realize your results. Additional minor changes, or settling, may occur over several months. 1. 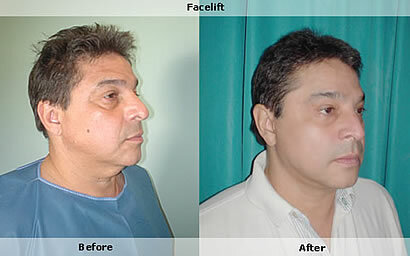 How is a facelift performed? 2. What can I expect from my facelift? 3. What age is best for a facelift? 4. Can a facelift be combined with other surgery? 5. What area of the face is not improved by a facelift? 7. Will I be able to eat anything I want? 8. Will there be pain after a facelift? 9. How long will I be in surgery? 10. How long is the recuperation period? 11. What type of anesthetic is used? 12. Will my head be shaved for the facelift surgery? 13. When do the stitches come out? 14. How long do facelift results last? 16. Can insurance cover a facelift? 17. Where is the surgery performed? 18. Will a bandage be applied? 19. When are the stitches removed? 20. When can I apply make-up? 21. When can I get my hair done? 22. Who takes care of me after my facelift? 23. What happens after the surgery? A facelift raises the facial skin, muscles, and subcutaneous tissue to restore a more youthful contour. In order to do this, incisions within the hairline and natural creases along the ear allow access to the deeper structures. Through a small incision beneath the chin, your surgeon will remove the excess fat of the neck and tighten the neckbands that form” the turkey neck”. The skin is pulled up and back, removing the excess behind the ears. All incisions are then sewn together. The purpose of a facelift is to make you look as good as possible. The facelift will improve the cheeks, and the jaw line; it will also improve neck-line by removing any excess fat that forms a double chin and neck-bands that form the turkey neck. Results are more predictable in some patient than in others. Influencing factors include the physical condition of the face, thickness and condition of the skin, facial fat, age, the amount of wrinkles, the bone structure, heredity and hormonal changes. Smoking is another important factor, as well, so important there are many plastic surgeons who refuse to perform a facelift on heavy smokers. 1) deep lines or folds running from the corner of the nose to the corner of the mouth (smile lines). 2) jowls or loss of well defined jaw line. 3) deep wrinkles in the cheeks and sagging of the "highlight" areas of the cheekbone. 4) loose skin wrinkles vertical cords or excess fatty tissue in the neck. Yes. Facelifts are most frequently preformed in combination with forehead lift, upper and lower eyelid surgery and correction of smile lines with fat grafts. If you smoke, you must stop smoking at least three weeks before surgery. Aspirin and other anti-inflammatory medication can cause excessive bleeding so you should not take these medications for two weeks before surgery. Smoking interferes with blood flow to the skin and can effect healing of the incision areas. It can cause scabbing and unsightly scars in visible places. If you wish to lose more than 15 pounds of weight, you should do so before the surgery so that all the skin that will sag can be removed at the time of the face-lift. Although you may eat anything you wish after surgery, most people find that they will not have an appetite the first evening. Take plenty of fluids and a soft diet that requires minimal chewing or opening the mouth. The dressing around the chin and cheeks may make it difficult to chew and open the moth completely. It depends on the amount of correction necessary. On the average a facelift takes 2 to 3 hours. There will be bruising of the face and neck for approximately 10 to 14 days. By this time all the stitches will be removed and you can resume normal activity and work. Most patients do not want to hear or see anything that is going on in the operating room. For these patients we recommend general anesthesia. The operation can also be done with a strong sedative and local anesthesia. No. Most of the incisions are inside the scalp and having long hair will help hide the scars and stitches during the healing period for both men and women. The first stitches are removed at five days and the remainder at ten days. The procedure will improve your present appearance but will not stop the aging process. 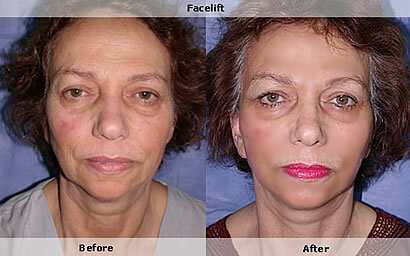 Depending on how well you take care of yourself the results of a facelift can last 5 to 10 years. In very few patients those who age more rapidly may desire another operation in less than 5 years. On the other hand, there are those who never require it again. Each person is different. In order to have your results last longer, it is important to maintain your weight steady, avoid sun exposure, and maintain the skin, keep it hydrated and protected from the sun with moisturizers and sun blocks. Significant complications from facelifts are very infrequent. Every year thousands of people undergo successful facelift surgery and experience no mayor problems being pleased with their results. All surgery carries some uncertainty and risk. Individuals vary greatly in their anatomy, physical reaction, healing abilities, and the out come is never completely predictable. Complications that can occur include hematoma ( a collection of blood under the skin that must be removed by the surgeon), injury to nerves that control facial muscles ( usually temporary), infection, and reactions to the anesthesia or medication. Poor healing of the skin is most likely to affect smokers. No. A face-lift procedure like any cosmetic plastic surgery is not covered by medical insurance. In a hospital operating theater. One of the many benefits of using SSI is all surgeries are always performed in hospital, this is for your safety. Yes, to the head and the neck. They are removed the day after surgery in your first appointment. The bandage is designed to maintain the operated area as immobile as possible, to protect the incisions from the environment and to help minimize bruising and swelling. 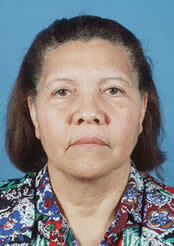 They are removed on the first post-operative day and after a light elastic bandage is placed around the chin. The first stitches are removed approximately on the fifth day, and the remaining are usually removed around the tenth day. The process is quick and uncomplicated. The surgeon or other members of the staff always remove sutures. On about the 10th day. Shampooing your hair can begin two days after surgery. The stitches should get wet. This helps in the cleaning process. You may apply rollers loosely. You may use a hair dryer in the medium to low setting, never hot because you may not have full sensation of the surgical area and could cause a burn. Tinting or coloring may begin three weeks following surgery. Your assistant will monitor your progress and take care of you on a daily basis assisting with your care after your return to the hotel. It is normal to develop bruises and swelling of the face and neck followed by a period where you look strange to yourself. If the face-lift is combined with eyelid and forehead surgery, the swelling will be present in more areas of the face, but you should be ready to resume our normal lifestyle in about two weeks. Slight emotional depression right after surgery can occur and usually happens at a time where you look the worst. Fortunately this will pass quickly..